Who Really Won the 1960 Election? David Stebenne is an associate professor of history and law at Ohio State University, and the author of Arthur J. Goldberg, New Deal Liberal (Oxford U. 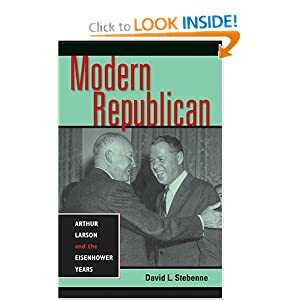 Press, 1996); Modern Republican: Arthur Larson and the Eisenhower Years (Indiana U. Press, 2006); and co-author (with Joseph Mitchell) of New City upon A Hill: A History of Columbia, Maryland (History Press, 2007). November 8, 2010 marks the fiftieth anniversary of the presidential election of 1960, which still very much interests those who care about disputed elections and how best to resolve them. The clearest sign of that continuing interest is the steady stream of new scholarly books on that subject. Some of the most recent include Gary A. Donaldson’s The First Modern Campaign: Kennedy, Nixon, and the Election of 1960 (Lanham: Rowman & Littlefield, 2007); William J. Rorabaugh, The Real Making of the President: Kennedy, Nixon and the 1960 Election (Lawrence: University Press of Kansas, 2009); and Edmund F. Kallina, Jr., Kennedy v. Nixon: The Presidential Election of 1960 (Gainesville: University Press of Florida, 2010). Why, one may wonder, does all this serious scholarly attention still get paid to a single electoral contest that ended half a century ago without (in marked contrast to Bush v. Gore in 2000) much in the way of recounts or lawsuits? There are several reasons for this. The 1960 presidential election was the first in which television can fairly be said to have been central to the result. By that year, most American homes had TVs for the first time. Richard Nixon’s decision to accept John Kennedy’s proposal for televised presidential debates meant that for the first time both major-party candidates appeared for a sustained period together on TV once it had become the nation’s dominant medium of mass communication. The novelty of this in 1960 produced very high rates of viewership, thereby making the election memorable and altering its outcome. Simply put, this form of “free media” provided the oxygen for Kennedy’s presidential bid that fall. Before the first televised presidential debate on September 26, most polls showed him behind. After it, most showed him ahead, a pattern that continued through Election Day. The impact of televised debates also showed immediately on the campaign trail. Following the first debate, the size of Kennedy’s crowds roughly doubled. Even more noticeable was the change in energy. Prior to the first debate, the mood among onlookers at most Kennedy rallies had been friendly but no more. After the first debate, Kennedy campaign appearances acquired the kind of energy and enthusiasm one associates with an appearance in 1960 of a rock and roll star. Journalists assigned to cover his appearances came up with new terms to describe the behavior of Kennedy’s young female fans. There were the “jumpers,” who began jumping up and down as his car approached, the “double jumpers,” who were pairs (usually sisters or friends) who jumped in unison while holding hands, and the “runners” who broke through the restraining line and pursued his car on foot. A second reason for the excitement then and interest later was the simple fact of Kennedy’s Catholicism, which broke an unofficial but still very significant “rule” of the American political system as it was in those days. Until Kennedy won in 1960, the sense of most knowledgeable people was that only a white, male, Protestant could realistically aspire to serve as the head of the American government. Even many of Kennedy’s liberal supporters firmly believed that, such as United Auto Workers union chief Walter Reuther, who had argued passionately during the 1960 primaries that no Catholic could be elected because anti-Catholic prejudice among Baptist and Methodist Democrats was too strong. A lot of older American Catholics with bad memories of Al Smith’s presidential campaign in 1928 felt the same way. All that earlier effort had seemingly accomplished was to stir up anti-Catholic sentiment to no positive result; why go through the same thing all over again, many of them thought to themselves, and sometimes said out loud. For Kennedy’s Catholic supporters in particular, the real “Massachusetts miracle” was not that state’s economic comeback in the 1980s but rather Kennedy’s victory in 1960, which altered assumptions about who could realistically hope to hold high public office in the United States and paved the way for the next person who was not a white, male, Protestant to win: Barack Obama in 2008. Kennedy’s victory, like Obama’s, also serves as a source of encouragement to many of those in the over 70 percent of the American population that is not white, male and Protestant. A third reason for the continuing scholarly interest in the presidential election of 1960, closely related to the TV and Catholicism factors, was that the outcome was an upset. Until the televised debates, most knowledgeable observers of the American political scene had assumed that Nixon would ultimately prevail. Yes, Kennedy was young, handsome, well-spoken and had a lot of family money behind him, the pundits acknowledged. For those reasons, he would make the contest interesting, it was quietly thought, but in the end come up short, thanks to the extraordinarily broad popularity of Eisenhower-era Republicanism, with which Nixon and his running mate (U.S. Ambassador to the United Nations Henry Cabot Lodge) were closely identified. Thus, as the 1960s opened, the prevailing view among the experts was that Republicans would retain the White House and the country probably would not change very much. Kennedy’s surprising victory helped alter that situation. As important as those three factors are in explaining continued interest in the 1960 presidential election, others have intensified that curiosity. That electoral contest was truly remarkable in that it was both the closest of the twentieth century and the one with the highest turnout ever. Kennedy’s margin of victory in the popular vote worked out to an average of one half of one vote per precinct nationwide, which is as close to a tie as we are likely ever to see. Even more striking was the high turnout. The most meaningful measure is the fraction of the adult population that cast ballots, and in 1960 that figure was the highest ever recorded. The national average was approximately 63.5 percent, but that figure is misleading in one important respect. On Election Day in 1960, the Jim Crow system still existed in the South and the Border States. That system’s barriers to voting (poll taxes, literacy tests, intimidation and all the rest) seriously depressed voting in at least fifteen states. In the other thirty-five, however, turnout was typically well above the national average. For example, in Franklin County, Ohio (where this commentary was written and published), the home of the state’s capital city (Columbus), voter registration as a percentage of all adults reached an all-time high in 1960, as did turnout: an astonishing 83 percent of all registered voters. The closeness of the election combined with the record turnout to put the maximum possible strain on the nation’s electoral apparatus, and ultimately led to problems in election administration. Those problems have also fueled continuing scholarly interest in the 1960 presidential election because of the difficulty in determining whether Kennedy really won through honest means or corrupt ones. Excessive partisanship on both sides has complicated that analysis. The first account of the election, Theodore White’s classic entitled The Making of the President 1960 (New York: Atheneum, 1961) was written by a Kennedy partisan. The second account, the part of Richard Nixon’s memoir entitled Six Crises (Garden City: Doubleday, 1962) that dealt with the election, was even more biased in favor of Nixon. Those two accounts helped create a partisan kind of debate on a serious issue, which has clouded clear thinking ever since. Scholarly analysis of the question of how Kennedy won has focused, quite rightly, on administration of the electoral process in two crucial states: Illinois and Texas. Kennedy ultimately was credited with the electoral votes of both, which gave him victory in the Electoral College tally. The problem with answering the question of how he prevailed there is twofold in nature. In Illinois, the most recent and fair-minded study (Kallina’s Kennedy v. Nixon) concludes that sufficient evidence does not exist to determine whether Chicago’s Democratic machine stole more votes there than Republicans did downstate. Texas presents a different kind of problem. A system of free and fair elections in the modern sense had not yet taken hold on the ground there in 1960. Voter fraud was fairly common, safeguards to prevent it were few, and 1960 was no different in those respects. Thus, the most dispassionate analysis of this issue from the perspective of fifty years later is that we will never know whether Kennedy really “won,” in the sense of what result an entirely honest and effective administration of the electoral process in Illinois and Texas would have produced on Election Day in 1960. But if Kennedy’s victory in a legal sense remains forever clouded, in a political sense there was no doubt, then or afterward. The GOP was much the weaker of the two parties nationally in 1960. In order for its presidential candidate to win then, he had to do so clearly or not at all. Those at the top of the nation’s political system understood that hard fact. Compounding that sense of a decisive outcome politically, if not legally, was that most leading Republicans privately blamed Nixon’s own mistakes, not Democratic cheating in Illinois and Texas, for his defeat. Even his own running mate thought so. Most decisive on that score was the attitude of outgoing Republican President Dwight Eisenhower. By Election Day Eisenhower had become certain of a Nixon loss and deeply angry with him for the way he had run his campaign. Eisenhower had urged Nixon not to debate Kennedy, predicting correctly that such extensive television exposure would ultimately help the lesser known-Democrat. Nixon compounded that mistake in the eyes of Eisenhower and other leading Republicans by failing to prepare properly for the debates, which left him feeling and looking weak and tired for the crucial first one. It was this divergence between legal and political factors more than anything else that explains why there was no Bush v. Gore type dispute after Election Day in 1960. Law and politics are closely related, but they are not the same. For Nixon to have mounted an effective legal challenge afterward, the two major parties in Illinois, Texas and nationally would have had to be in better balance, and his own leading supporters would have had to believe that Nixon had run the better campaign and so been robbed. Thus, the outcome in 1960 has had longer-term implications for disputed elections, but not very obvious ones to most students of that episode. The resulting confusion continues to drive research, discussion and debate, with no end in sight. Nixon also contends in his book that he did not go to court because he did not want to cause a Constitutional crisis, and also because the country would be harmed by a long delay if he did that. As for Cook County, throughout most of the 20th century the Chicago machine would hold back its totals until downstate Republicans had reported all their votes, in order to see how many they needed to manufacture... I can never believe JFK won Illinois honestly in 1960, any more than I can believe HST was not crooked when he worked for the Prendergast machine in KC. victory in Texas by 57 votes, which earned him the sobriquet, "Landslide Lyndon." And Pat Hurley was cheated out of a senate seat in New Mexico. I had the distinct impression at the time that being Catholic was more of a help than hindrance to JFK. A joke circulated at the time: What's the biggest lie in the world? (There followed three wrong answers such as 'the check is in the mail'). Then, "No," went the punch line, "the biggest lie is I'm Catholic, but I didn't vote for him!" According to Theodore White's "The Making of the President 1960," Nixon decided not to mount a voter-fraud challenge because he did not want to cause a Constitutional crisis. Also, an article some years back in "The Journal of American Studies" analyzed the Cook County results, concluding that the fraud was on behalf of the State's Attorney candidate and that, while there was ome slopover for JFK, it was not enough to make the difference. JFK won Illinois honestly.